This unique goats milk based baby milk is suitable from birth and is certified organic. Should a child have an allergic reaction to cow's milk, he or she may be able to tolerate goat's milk as an alternative. Goat's milk can, however, also cause allergies since some of the protein structures contained in cow's and goat's milk are the same. Key here is which protein the child has an allergic reaction to. 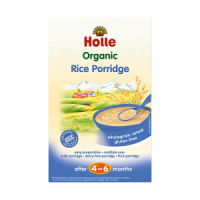 This should, in all cases, be diagnosed by a doctor in order to clarify whether Holle Organic Infant Goat Milk Formula is a suitable alternative for your child. Please also note that breast milk is always the best source of nutrition for your baby. 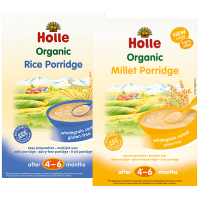 Holle recommends exclusive breast feeding for the first six months. Instant preparation. Please follow instructions on the packaging. Contains milk (from goats). Suitable from birth. Suitable for vegetarians. 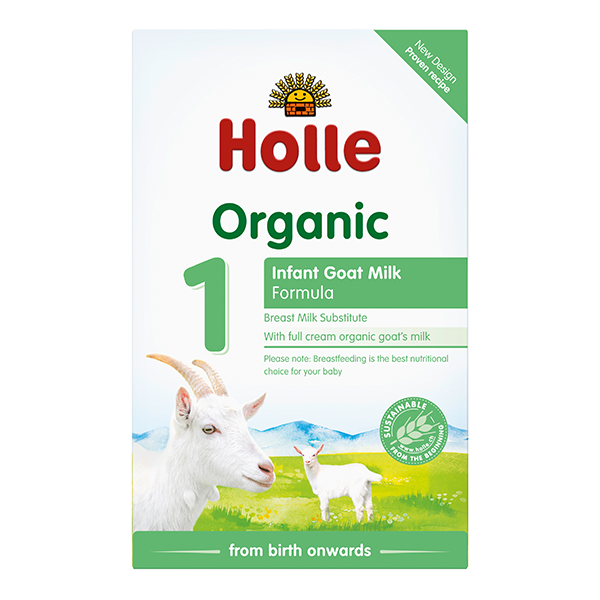 Standard preparation: 13.2g Holle Organic Infant Goat Milk Formula 1 powder + 90ml boiled water = 100ml ready to use bottle feed. One carton of 400g milk powder gives around 30 feeds of 100ml. Energy: 500kcal/100g milk powder or 66kcal per 100ml prepared bottle. Protein: 11g/100g milk powder or 1.5g per 100ml prepared bottle Carbohydrates: 56g/100g milk powder or 7.5g per 100ml prepared bottle of which sugar 29g /100g milk powder or 3.9g per 100ml prepared bottle of which lactose 27g/100g milk powder or 3.6g per 100ml prepared bottle For full list of nutritional values please see packaging or email us. I love this product. I am so happy with this formula, especially since there are little to no alternative options for babies with cow allergies. Great experience overall! 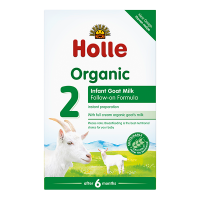 The Holle goat's milk formula is soooo much better for my little boys tummy. Much more satisfied after feeds, putting on weight nicely, much better nappy changes too! It is slightly smelly but still overall great. Also, love the fact it's suitable for vegetarians, as this is how we ideally wanted to raise him. Product delivery prompt and customer service perfect as per usual. After months of trying to find a formula that suited our baby we finally found this product. From day 1 we haven’t had any stomach issues, he is comfortable. He sleeps a lot better. Sadly my milk supply wasn’t enough and I was starting work was it was essential to find something ASAP. I love that the product is organic and I’m giving my baby the best start to life (after all the breastmilk from me). Ulula are also a great company to buy through. One very happy mum and baby!!! We have changed the Aptamil cow mill to Ulula goat milk. We didn’t have any problem and our baby is happy, feeding and pooing better. Lovely Fomula, my baby liked it straight away! Lovely milk, easy to make and mix! My baby loves it! I’m so happy with the formula, my daughter loves it also. I so glad to find a website that provides goats milk. The website is easy and straightforward and the product arrives in a few days. In with the multi pack was free baby tea and some porridge which is a great touch and my daughter loved them too. Very happy with Ulula and would highly recommend. Thank you Ulula for producing a goats milk based formula and making it easily accessible to buy! My baby daughter has eczema and so I wanted to give her a formula that was goat’s milk based rather than cow’s milk or soya based. As with all products that I’ve bought from Ulula (including porridge and spelt rusks as well), my two daughters really enjoy the food/milk. The service is excellent every time, and it is great that I can buy all the items in boxes of 6 (so I can stock up on the food in the house and avoid many delivery costs) And delivery is very prompt! Used as an addition to the breast feeding and baby took to it without any problems. Good for nature, good for us.